Why do some political leaders create and strengthen institutions like title registries and land tribunals that secure property rights to land while others neglect these institutions or destroy those that already exist? How do these institutions evolve once they have been established? This book answers these questions through spatial and temporal comparison of national and subnational cases from Botswana, Ghana, and Kenya and, to a lesser extent, Zimbabwe. 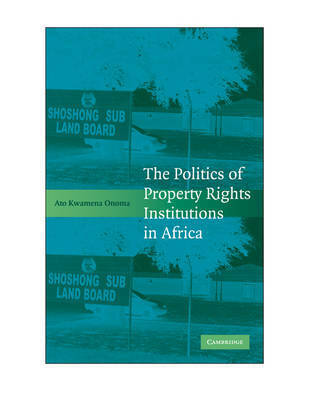 Onoma argues that the level of property rights security that leaders prefer depends on how they use land. However, the extent to which leaders' institutional preferences are translated into actual institutions depends on the level of leaders' capacity. Further, once established, these institutions through their very working can contribute to their own decline over time. This book is unique in revealing the political and economic reasons why some leaders unlike others prefer an environment of insecure rights even as land prices increase. Ato Onoma is Assistant Professor of Political Science at Yale University. After receiving his PhD from Northwestern University, he was a postdoctoral Fellow at the Niehaus Center for Globalization and Governance at Princeton University. His was featured in Explaining Institutional Change: Ambiguity, Agency, and Power, a collection of essays edited by James Mahoney and Kathleen Thelen (Cambridge, 2010).